There are probably as many ways to test an API as there are APIs. The challenge is to find a tool that doesn't interfere with your normal workflow. Hypernap was built to be easy to use when you need it, and easy to hide when you don't. No terminal commands that are hard to remember, no browser extensions that's hard to reach and no applications that keeps getting in your way. 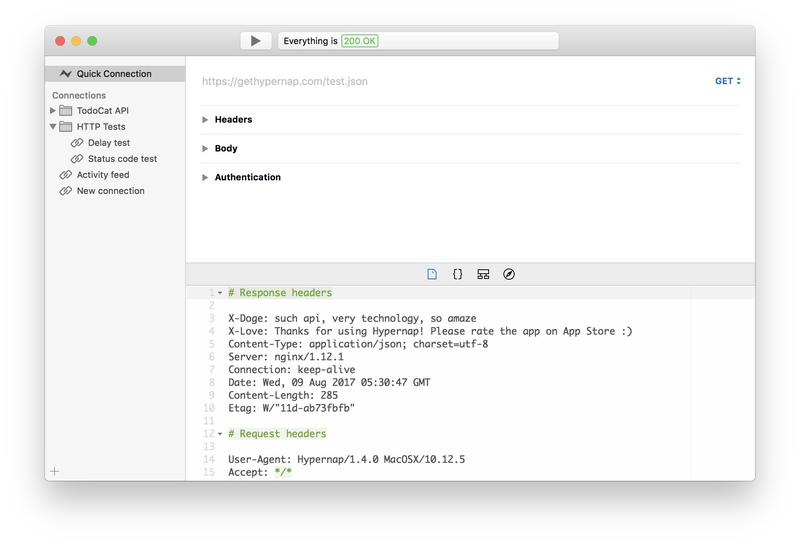 As you may suspect, Hypernap is simply a graphical interface for doing HTTP requests, but what makes this application different is the experience. And of course, that all begins with making the actual requests. Hypernap lets you create connections, each with different URLs and other data. You can add your own HTTP headers and POST data. If the API you're using requires authentication, you can add that as well. The result is presented in three different views. The first view shows all headers that was used and recieved, the second shows the response body from the URL you requested, and the third one will show the outline of JSON- and XML-documents. Creating connections and grouping them in different folders, by project for instance, is a great way to save your requests for future reference. Just drag and drop to order them however you want. It's almost like having your own documentation! 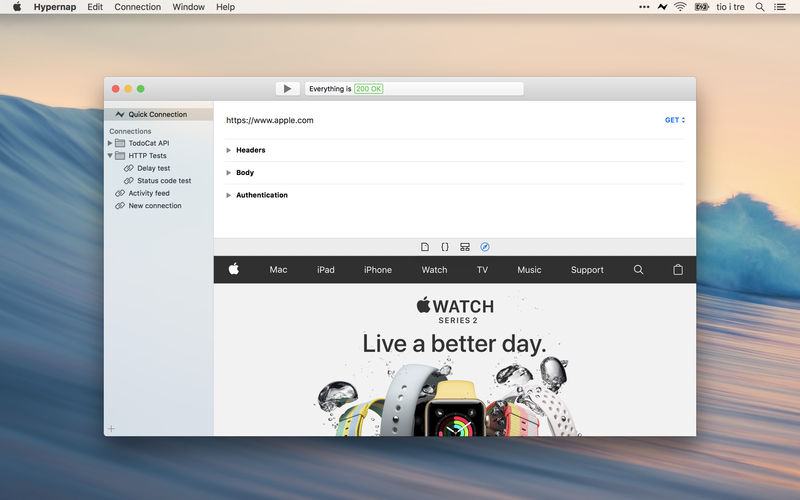 Not a problem, just drag the Hypernap window away from the menubar, and it will automagically detach. Drag it back to the same position to attach it again. This is also a great feature for those moments when you do a lot of API testing at once and want to keep the results open for a while. 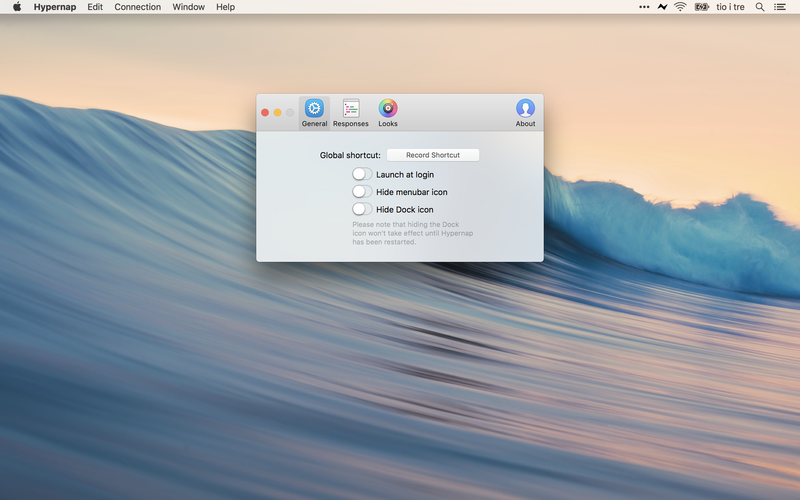 Hypernap has a lot of preferences avail­able to make it fit your workflow better. You can choose to hide the Dock-icon or the menuicon if you don't want them, and set a global hotkey for quick access. There's also a few more preferences available solely to make Hypernap more personal. 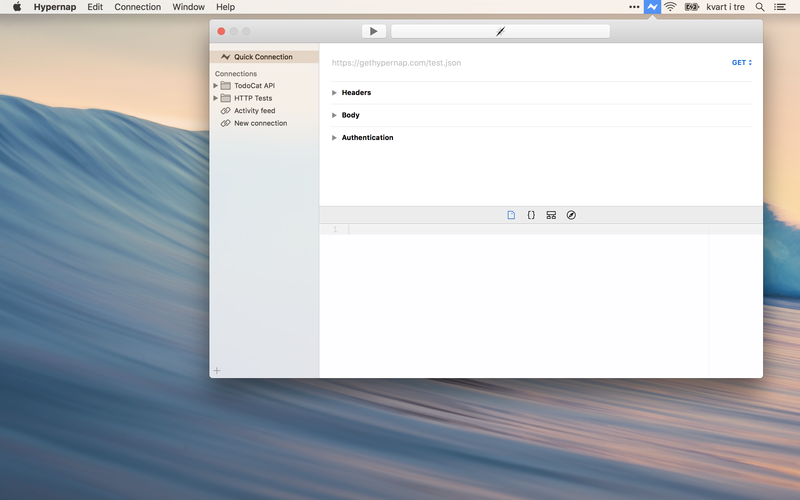 You can choose between a bunch of icons for your menubar, and change between popular themes for the code editor. Overall a great app, with a nice polished interface and enough niceties to make it well worth the asking price. 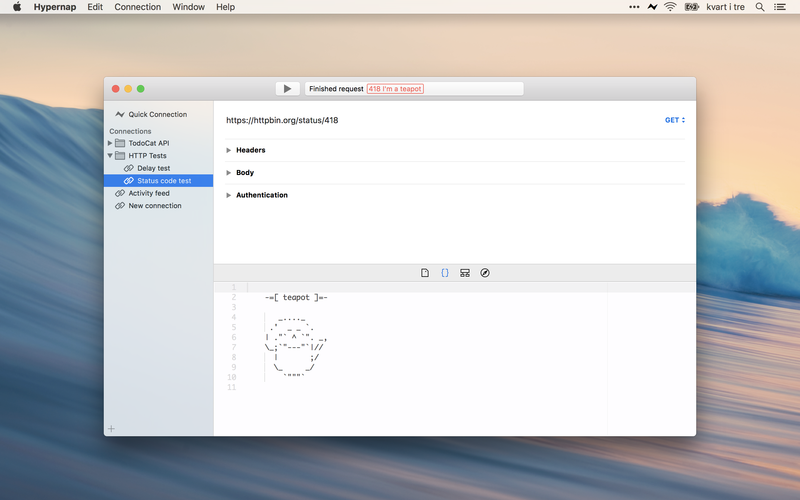 SoftpediaHypernap proved itself to be a well-thought-out application that [...] can make your work with APIs be more efficient and seem more relaxing. Thanks for this! I've been looking for a native app that isn't a cluttered mess for such a long time. This looks great!